Andrew Curtis (b. 1979, UK) graduated with an MA in Fine Art Printmaking from the RCA in 2009. He was one of the shortlisted artists for the prestigious Clifford Chance Postgraduate Printmaking Prize in 2009. 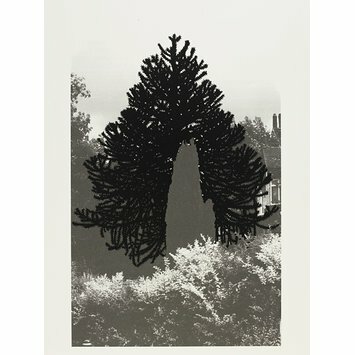 His most notable works to date are his series of photo-etchings and screenprints entitled New Empire and Wild England. These explore suburbia through two familiar features - the Monkey Puzzle Tree (Araucaria araucana) and the Torbay Palm (Cordyline australis). 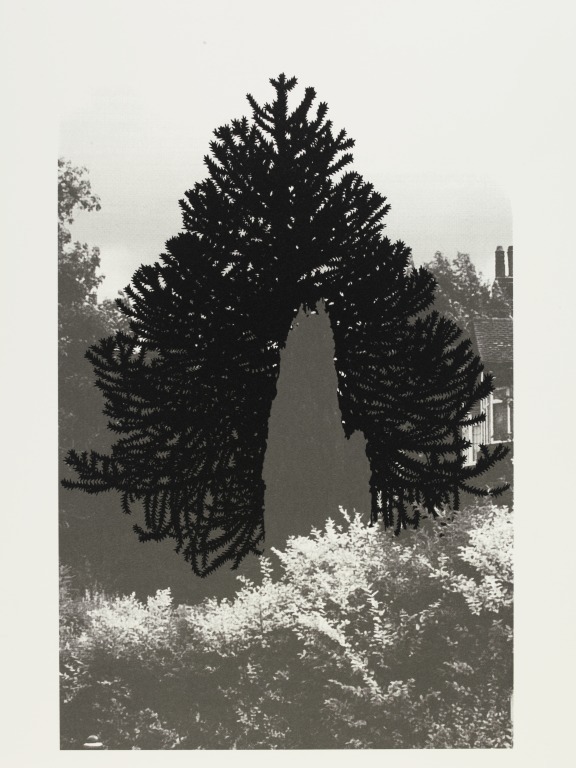 In these prints he explores the disjunction between the familiar and the exotic which these plants embody in the setting of suburban Britain. The Monkey Puzzle Tree in particular is an anachronistic sign of cultural appropriation, planted by the Victorians in suburban gardens and now a prominent reminder of British colonial activity in the 19th century. These trees are discordant elements in the suburban landscape, clearly alien and yet common enough to have become familiar; often they have grown to an enormous height, dwarfing the other plants and shrubs and even the houses. Curtis doctors his original photographic imagery to make the tree an even more emphatic and immediate presence, often in the foreground of the picture, a brooding defensive barrier or a kind of monumental sculpture. Edition number; signature; date. All in pencil. Print, Whitby Jet pigment on paper, 'Wild England: Mild Paranoia', Andrew Curtis, England, 2010.